1. Heat the oil in a large pan, add the leek, onion and a pinch of salt and sauté over a medium heat for 10 minutes, until softened. Add the potato and cook for 10 minutes more until tender, then add the stock and bring to the boil. Tip in the peas, then take off the heat and set aside for 10 minutes. 2. Pour into a powerful blender (in batches, if needed) with 2 tbsp chives and whizz until smooth. Add 3 tbsp dairy-free coconut yogurt and whizz again. Season with salt, pepper and lemon juice to taste, bearing in mind that the fl avour will dull slightly once it is chilled. It will also thicken as it cools, so add a little water to loosen to the consistency of single cream. 3. Tip into a jug and chill for at least 4 hours, or overnight. 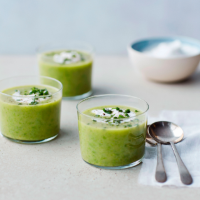 To serve, pour into glasses, top with a dollop more yogurt and garnish with the chopped chives. For cooler nights, this soup tastes just as lovely served warm.